It takes years of intense training to become a great wizard like Albus Dumbledore from the Harry Potter novels. You can't just learn thousands upon thousands of powerful spells overnight, which is probably a good thing. If we knew all the spells that Dumbledore did during his time as Hogwarts headmaster, then we probably would have used those powers to cause some kind of terrible mischief that would have lead to a hasty trial in front of the Wizard Council of Magical Law and that's the last thing we want! We do, however, want a wand. Even though we don't have the magical prowess of master wizard, we still want one to waggle through the air while we spout gibberish. Now, anyone can swing a wand through the air like master wizard! This Dumbledore Illuminating Elder Wand looks just like the one wielded by the legendary wizard. Of course, if you're a muggle, it won't give you any sort of magical powers, but it will make you feel like a super powerful wizard! 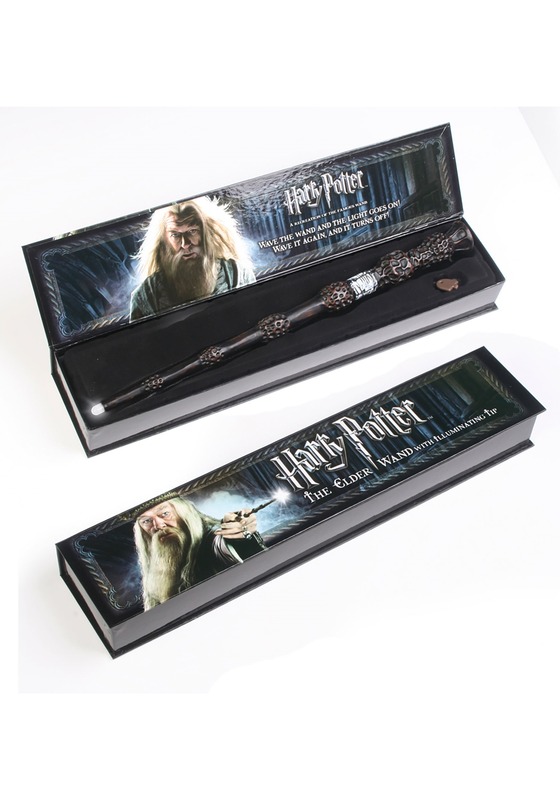 You see, this licensed item has a glowing tip that activates with the swish of the wand. That means you can waggle it around to your muggle heart's content and everyone will think that you've spent years studying magic.